Yes, that's right. "Tonight" tomorrow. By "Tonight," I mean the classic song from "West Side Story," whose film version celebrates its 50th anniversary this year. And by "tomorrow," I mean that "West Side Story" will be back on the big screen on Wednesday, November 9, at 7 pm at the Starplex Normal 14 Stadium. 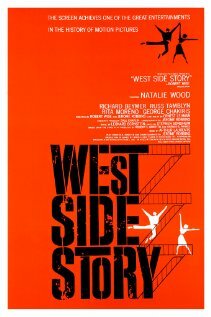 Turner Classic Movies (TCM), in conjunction with NCM Fathom, is presenting special screenings of "West Side Story," which won 10 Oscars, including Best Picture, back in 1961, to celebrate that anniversary. TCM's info says, "This extraordinary event includes an exciting new Turner Classic Movies original production followed by MGM’s 50th Anniversary restoration of West Side Story." Although the movie was a big hit, it's always seemed strange that Natalie Wood was cast as Maria and Richard Beymer was cast as Tony, since neither can sing. They were dubbed by Jimmy Bryant and Marni Nixon for the big songs. Still, the acting is good, and the three dance roles -- Biff, Bernardo and Anita -- are done very well. As Bernardo and Anita, George Chakiris and Rita Moreno both won Academy Awards. Russ Tamblyn, who played Biff, wasn't nominated for anything, but I still love him in that role. Robert Wise and Jerome Robbins, who shared directing honors, also took home an Oscar. This "Romeo and Juliet" in Hell's Kitchen still looks and sounds fresh and exciting today, mostly because of Jerome Robbins' iconic choreography, Leonard Bernstein's soaring music and Stephen Sondheim's wonderful lyrics. Although people make fun of teen gang members singing and dancing, it really, really works for me in "West Side Story." The stage version, where Sondheim's lyrics are partially translated into Spanish to give it verisimilitude, has been touring around, giving lots of people a chance to see it live and in person. But I saw it first at the movies. As much as I love live theater, I still think that all the flashy dancing, stirring music and deathless passion seem that much more real on the big screen when it comes to "West Side Story." Yes, this movie is still "Cool." Oh, and Office Krupke? Krup you! For details on the Bloomington-Normal screening, click here. I and all my contemporaries in high school LOVED this movie! It had one of those "road show" engagements big-deal movies used to get: playing at first in one theater in each big city, with reserved seats and an intermission and you could buy a souvenir program. I saved up and saw it that way twice. We can now learn from the DVD commentary that Tony and Maria weren't the only ones whose singing was dubbed! Rita Moreno does most of her own singing, but Betty Wand helped out with the high notes in "America." And Russ Tamblyn in the "Jet Song" sings with the voice of Tucker Smith (who plays Ice and gets his own song "Cool"). Tamblyn remarks that the music supervisor was just berserk about voice ghosts, and liked to use them even when they weren't particularly necessary. Stephen Sondheim has now revealed in his book of lyrics that he originally planned to be the first lyricist to get "F*** you!" uttered on the Broadway stage. But he was talked out of it early on, and Lenny Bernstein came up with "Krup you! ", which Sondheim concedes is wittier. Will you be seeing it tomorrow night, Jon? Had you head about this TCM Special Event? No, I leave early Thursday for a conference in San Francisco, so no night out for me tonight. Are you seeing it?